Can't have a press conference without mentioning GTA V! Sony's PS4 wasn't the only hotshot at Gamescom 2013, as the PS3 got a little love too. Sony's presentation opened rather anticlimactically with a brief video and a lengthy presentation in which Sony Worldwide Studios President Shuhei Yoshida fiddled interminably with the new console's UI and menus. Gameplay footage from Killzone: Shadow Fall and detached audio soundbites apparently uttered by developers followed. 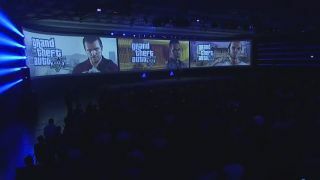 However, the dialogue turned quickly to the PS3 when Sony Computer Entertainment Europe President and CEO Jim Ryan then took the stage to make some announcements. Ryan began rather incongruously with an Oscar Wilde quote about art imitating life. He then revealed that Gran Turismo 6 will feature concept cars from big name auto companies, and that some of the in-game concepts will be turned into real-world cars. He also discussed the Gran Turismo film announced last month. Next game news of LittleBigPlanet hub, a free-to-play online community based around the Sackboy-starring creation and platforming title. Finally Ryan announced a PS3 hardware bundle with Grand Theft Auto V and a custom headset, plus 75% off for Rockstar games for players who pre-order GTA V on PS3. Yay, there's finally a release date for the PlayStation 4!